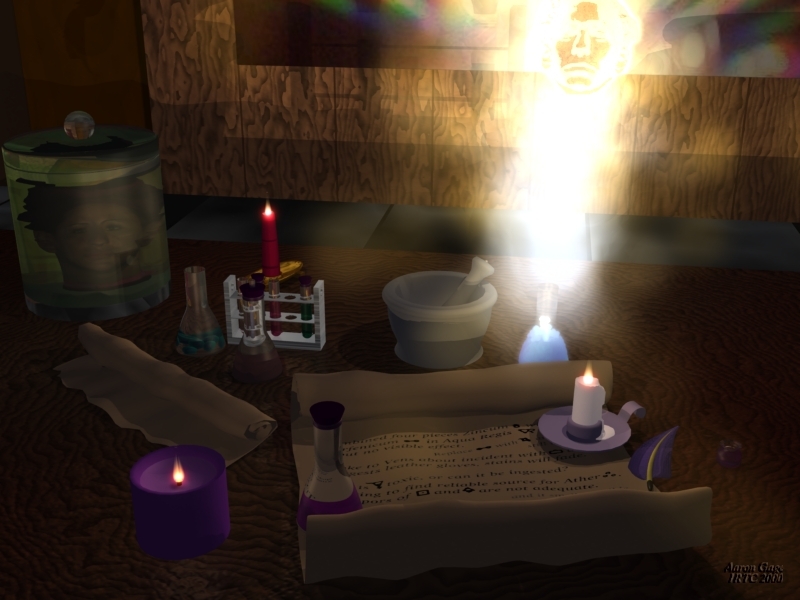 This image was entered in the September/October 2000 Internet Ray-Tracing Competition for the theme of The Laboratory. This was my second stills entry made with Lightwave. Be sure to notice the link to "View previous rounds" on the IRTC page, or you may miss the hundreds of incredible submissions that reside there! The concept for this image started off around the idea of alchemy, of having various pieces of apparatus scattered around a lab. However, it was suggested that I add a face to the scene, which suddenly changed the image to one of necromancy (dealing with the dead). All of the objects were made from scratch, with the exception of the heads, in Lightwave's Modeler. The head was borrowed from scans done of real heads using a Cyberware scanner, cleaned up, and trimmed to suit the scene. My thanks to Mark Powell for the inspiration and help with other aspects of the image. All rights to the above image are reserved by its creator, Aaron Gage.